I love product roadmaps. A good roadmap will show you where a product is going, and whether it’s going your way. And since we’re doing our best to create a management service you can rely on, it’s important to show you all the goodies we have in store for you. We compiled a ton of great feedback you’re constantly sending, ran it by our product team, and came up with a first quarterly ManageWP roadmap. 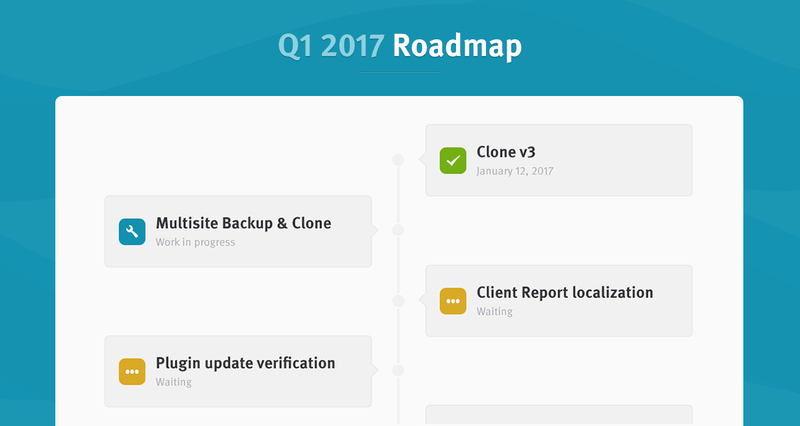 As you can see, the Q1 2017 roadmap is in full swing, with Clone v3 launched in January. This was a huge undertaking; we basically rewrote the Clone add-on so we could apply everything we learned in the meantime. In the month since its launch we worked out the kinks that come with every new major chunk of code, and it surpassed Clone v2 by a large margin. Multisite Backup & Clone is almost done, and we’re expecting to launch it in March. If you ever tried to back up a multisite using a plugin, you know that it’s a huge pain. We aim to take that pain away by offering a reliable backup solution that’s also able to restore individual sub-sites, as well as the whole network. And the best part? The price tag for such a valuable feature will put a smile on your face. Client Report localization is also something you’ve been requesting for a long time. You speak great English, but your clients might not. By providing them with a localized Client Report you’ll make an even better impression. The technical part is nearly done, but we need to figure out if we’ll provide the translation internally, or open it up for the WordPress community. Update verification is a pretty cool surprise, so I’m not gonna spoil it. All I can say is that it’s a step closer to the Holy Grail of WordPress: 100% reliable updates, where you update 50 websites with a click and no worry. That’s it for now. We’ll check items off this quarter and update the roadmap as new improvements and features are approved by the product team. It’s gonna be an exciting year! Can’t wait till I can send reports in German language to my valuable customers! Just to clear up one thing: you won’t be able to clone just an individual subsite. Too many things can go wrong when removing a subsite from a multisite. You can, however, clone a whole multisite network, clean up whatever is outdated, and clone it back to live server. Nemanja, no need to go overboard with customisation. Adding a print quality logo and switching a main colour would really be enough. Your team did a great job with improving the reports (so that we don’t have to build every report client by client and the reports go with personalisation). That moved us from the backup bundle to the full package. We still face issues with connecting websites. Working on the quality of the core is the most important work you do. That said, we’re looking forward to better Multisite support.. I believe Multisite is getting a lot of love as we speak – if the QA team has completed the audit, by tomorrow you will be able to back up, clone and restore Multisites with ease. Please, please, please can we get the ability to reply to comments. In general I really think the comment system needs to be made a larger feature. It would be incredible to have a central dashboard section to reply, edit and moderate all comments from multiple websites. Duly noted! Aside from the ability to reply to comment, is there any other fuctionality you’d need for comment moderation? You had my attention at “Multisite backup & clone”. Any news on custom client report branding? Changing fonts / colours at a basic level, total layout would be ideal! When Clone v3 and multisite backup were prioritized, they pushed back all the major initiatives. Don’t worry, we still want to publish an API, but it’s on the back burner for now. This is the feature I’ve been waiting for. I agree. You should have more control over the report design, so you could align it better with your brand. Customization has been approved for quite some time; once we set an ETA, I’ll add it to the roadmap. Great to see that Client Report localization will be for Q1, we talked about it in WCAthens and this feature will be great for clients here in Spain! I’m looking forward to seeing localized reports as well! As WordPress is becoming more and more multilingual, so should all the major tools and services.